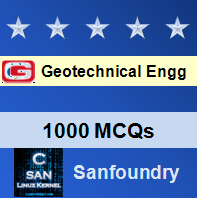 This set of Geotechnical Engineering Multiple Choice Questions & Answers (MCQs) focuses on “Coulomb’s wedge theory”. Explanation: The wedge theory of earth pressure is based on the concept of a sliding wedge which is torn off from the rest of the backfill on a movement of the wall. 2. Which of the following is a basic assumption of the wedge theory? i. The backfill is dry, cohesion less, homogeneous, isotropic, and elastically undeformable. iii. The sliding wedge itself acts as a rigid body. Explanation: According to wedge theory, the forces acting on a wedge of soil are its weight W, the reaction R along the plane of sliding and the active thrust against the retaining wall. Explanation: The active lateral pressure of intact saturated clays for temporary works or immediately after construction of a retaining wall is calculated by assuming φ=φc=0. Explanation: The three forces acting on a trial wedge are: i) the resultant force that exist between the free body and the wall ii) the weight W of the wedge iii) the resultant reaction between the wedges and the rest of the soil along the surface. Explanation: The Rankine’s active earth pressure (assuming the wall to be smooth) can be found out by method of trial wedges. Explanation: In wedge theory, the angle between the slip plane and the ground is called the critical angle λ. Explanation: The φ-line shows a plane inclined at an angle φ to the horizontal at which the soil is expected to stay in the absence of any lateral support. The line therefore is called the natural slope line or repose line. Explanation: In 1971, Professor Rebhann presented that the criterion for maximum active pressure is present at the slip–plane of the assumed triangle.